Milward Brown’s has published a report about the Top Fastest Growing Brands of 2011 in which they includes websites from different categories like social networking websites, technology websites, search engine websites, online shopping website, restaurants, commercial banks, stock markets, insurance companies etc. The most interesting part of that report is that first time Milward Brown’s has includes the social network website in their categories. According to the Milward Brown’s report Facebook is the Fastest Growing Brand of 2011 and it’s toping the chart of annual ranking of the top 100 consumer-facing brands worldwide. Any strengthening of Facebook’s brand would probably register in the form of bigger advertising sales, and so far, revenue estimates seem to bear that out. The brand strengthening also seems more fascinating when you consider it outpaces the likes of Starbucks in the pace of growth, According to the report. 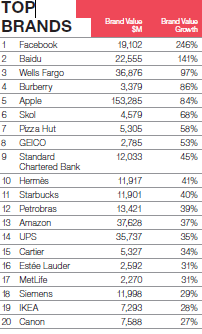 You can also check following chart of Top 20 Fastest Growing Brands of 2011. You can also Download Top 100 Brands PDF report from here.